This juice is enriched with natural vitamins. Key Ingredient: amun (Indian Blackberry) - Eugenia Jambolana NO ADDED SUGAR, VITAMIN AND MINERALS. 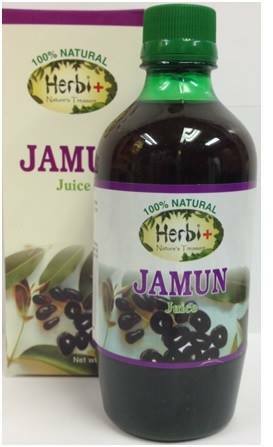 Buy Herbi+ Jamun Ras (Indian Blackberry) Juice - 16.8 - 33.6 oz, sold & shipped by Quality Indian Goods where you can shop online for Exclusive Collecton of Indian Cookware, Utensil, Religious Items & Gifts. This Herbi Juice collection has been tagged as Organic, Health, Ayurveda, Herbal, Natural Juice.